In my past 5 weeks of getting back into Morse Code I've found that I like to use my paddles with the radio's internal keyer and switch to my straight key or vice versa. But the Elecraft KX3 standard key input (KEY1) on the side of the radio can only be configured for one Key type at a time. I have to go into the menu and change the setting for KEY1 back and forth between it's iambic KEYER mode and HAND mode. This requires pushing the menu button, rotating the selector to the proper menu item, then rotating a different knob to choose KEYER or HAND mode. 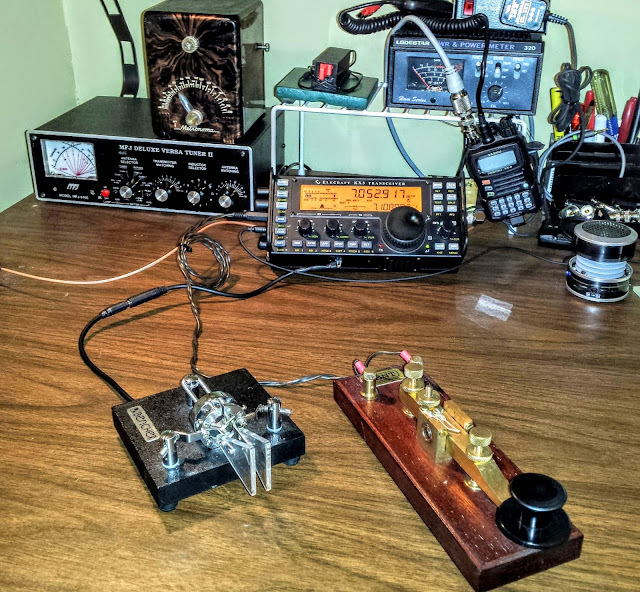 That's just too much effort during a QSO. I've seen key switching solutions where a rotary switch is used to select from a collection of keys but that still doesn't help switch between a straight key and a paddle unless I purchase an external keyer for the paddles. But the KX3's internal keyer is quite nice having a dedicated knob to quickly change keyer speed as well as front panel operated memories with repeat, so I really don't need or want to buy an external keyer. 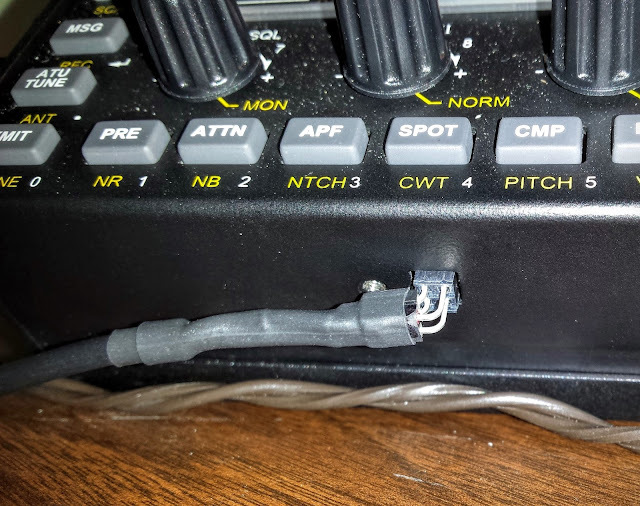 The Elecraft KX3 has another key input (KEY2) which has a separate configuration from KEY1, This allows one input configured for a straight key and the other for a keyer. The tricky bit is that the input for KEY2 uses a 2x2 pin configuration recessed into the front side of the radio. This is intended to be used by the proprietary paddle attachment for the KX3 which mounts on the front of the radio. When I searched the web I couldn't find anyone who makes a ready-made adapter for this port to a stereo jack. So I decided to make one. The nice folks at Elecraft sent me the schematic for the KEY2 input and I ordered the 2x2 header from them used in their proprietary paddle kit. So when you wire your 2x2 header here's the key (pun intended). Upper left is "halt-catch fire"
By the way. While I'm mentioning Elecraft let me just say I think they have one of the finest customer service groups of any company I've dealt with. They respond to emails in record time and provide you with any information you may need concerning their products. The recessed port for KEY2 is too tight to fit a header covered in shrink tubing so what I have done is connect the cable to a header and then plug that header into the Elecraft proprietary header that has a right angle set of pins coming out. The Elecraft header seems slightly deeper than a standard header and has the right angle pins. I plan on using some hot glue to cover the exposed pins and give some mechanical strength to the connection but this works fine on the desk for now. So now I am free to use either key as the mood strikes.